Just because something appears in a newspaper doesn’t necessarily make it true, 1865. 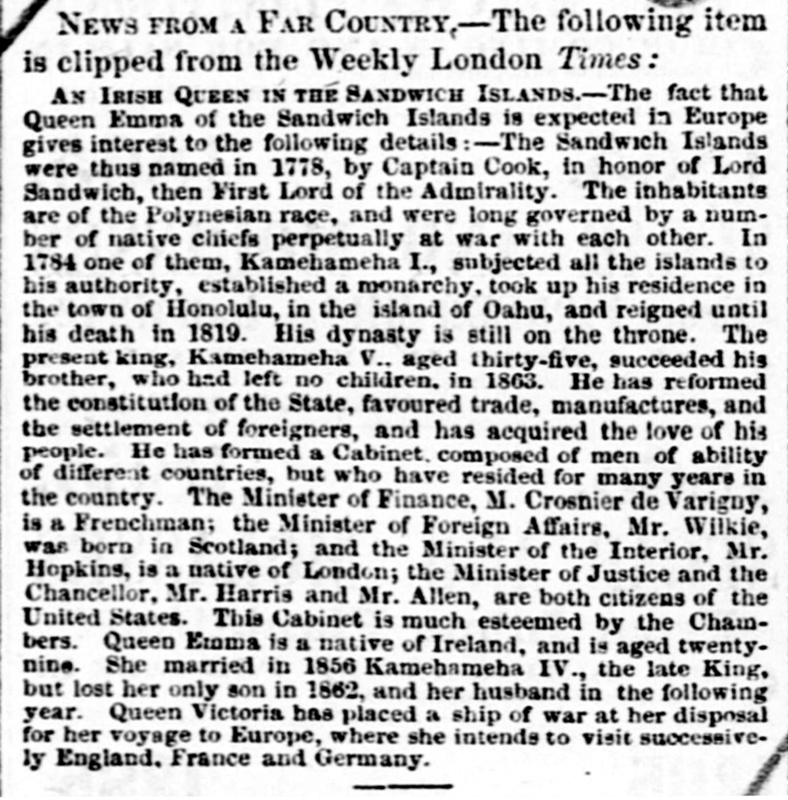 An Irish Queen in the Sandwich Islands.—The fact that Queen Emma of the Sandwich Islands is expected in Europe gives interest to the following details:—The Sandwich Islands were thus named in 1778, by Captain Cook, in honor of Lord Sandwich, then First Lord of the Admirality. The inhabitants are of the Polynesian race, and were long governed by a number of native chiefs perpetually at war with each other. In 1784 one of them, Kamehameha I., subjected all the islands to his authority, established a monarchy, took up his residence in the town of Honolulu, in the island of Oahu, and reigned until his death in 1819. His dynasty is still on the throne. The present King, Kamehameha V., aged thirty-five, succeeded his brother, who had left no children, in 1863. He has reformed the constitution of the State, favoured trade, manufactures, and the settlement of foreigners, and has acquired the love of his people. The Minister of Finance, M. Crosnier de Varigny, is a Frenchman; the Minister of Foreign Affairs, Mr. Wilkie, was born in Scotland; and the Minister of Interior, Mr. Hopkins, is a native of London; the Minister of Justice and the Chancellor, Mr. Harris and Mr. Allen, are both citizens of the United States. This Cabinet is much esteemed by the Chambers. Queen Emma is a native of Ireland, and is aged twenty-nine. She married in 1856 Kamehameha IV., the late King, but lost her only son in 1862, and her husband in the following year. 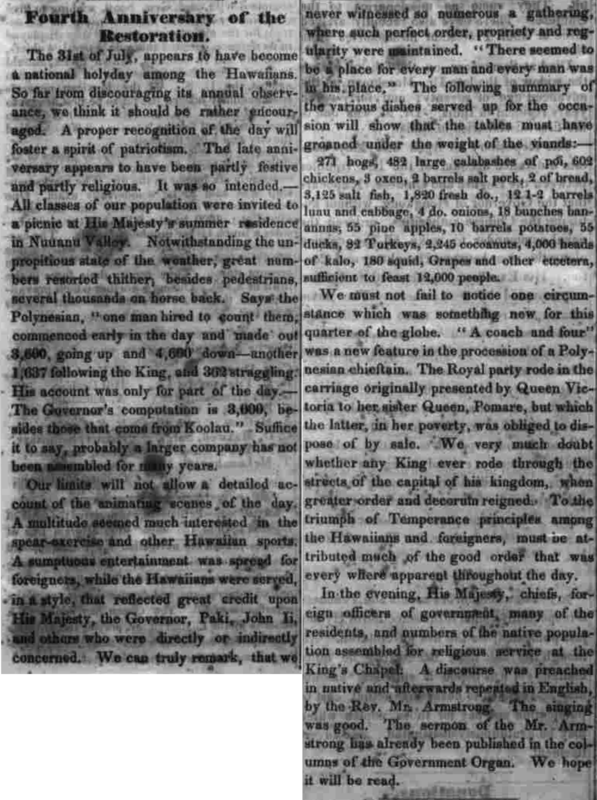 Queen Victoria has placed a ship of war at her disposal for her voyages to Europe, where she intends to visit successively England, France and Germany. The Pacific Commercial Advertiser, Volume X, Number 13, Page 2. September 30, 1865. Queen Victoria letter to Sanford Dole, 1894. Queen Victoria to President Dole. 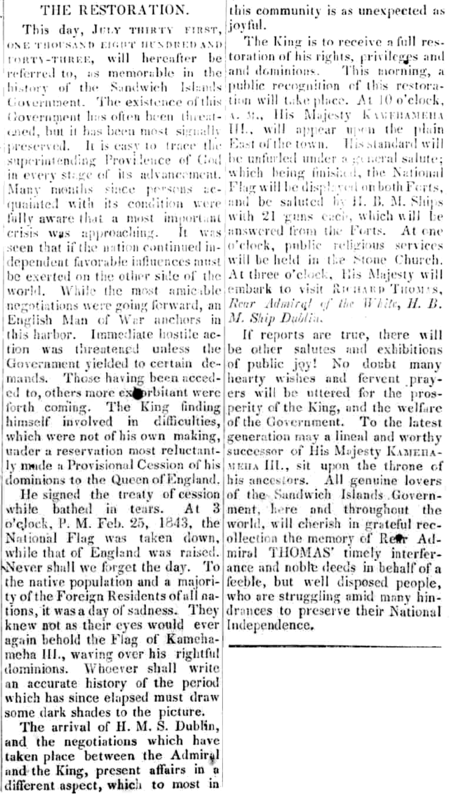 At midday of this past Thursday, the President gave an audience in the Executive Building [Iolani Palace] for the Queen of Britain’s Commissioner and Consul General, Mr. A. G. S. Hawes, who handed over to him personally this important national greeting from the Royal one, Queen Victoria. Victoria, by the grace of God, of the United Kingdom of Great Britain and Ireland, Queen Defender of the Faith, Empress of India, and so forth, and so forth, and so forth. To the President of the Republic of Hawaii, Sendeth Greeting! Our Good Friend! 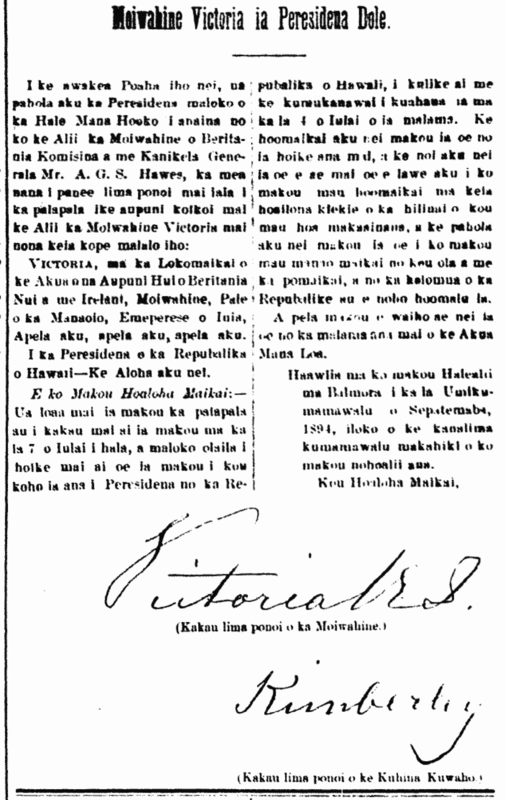 We have received the letter which you addressed to us on the 7th day of July last, in which you informed us that you had been elected President of the Republic of Hawaii, in accordance with the constitution which was proclaimed on the 4th of that month. We thank you for this communication, and we request you to accept our congratulations on this distinguished mark of the confidence of your fellow citizens;and we offer you our best wishes for your health and welfare, and for the prosperity of the Republic over which you preside. And so we commend you to the protection of the Almighty. Given at Our Court at Balmoral the nineteenth day of September 1894, in the 58th year of our reign. 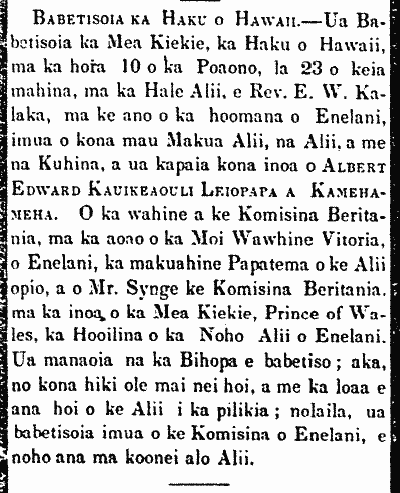 Ka Nupepa Kuokoa, Buke XXXIII, Helu 46, Aoao 2.